Leaping over a gap to unsuspecting zombies. Leap (named Leap Attack prior to March 2012) is a Defensive Barbarian skill unlocked at level 8, making the Barbarian leap, causing damage and knockback upon landing. When using this skill the Barbarian leaps at a high rate of speed from his current location to the targeted spot, dealing considerable damage upon impact. The rune effects provide a variety of modifications and bonuses, both to offense and defense. This skill is one of the Barbarian's movement abilities. Patch v1.0.4 improved Leap by making it a better movement skill. The Barbarian can now use it even while immobilized by CC effects. This means that a Barbarian who is jailed or otherwise stuck can use Leap while in that state. Leap will not dispel the effect (the way Furious Charge or Wrath of the Berserker do), but a Barbarian who is jailed can at least move (taking the jail cell with him) out of the way of AoE dangers such as Plagued, Desecrator, Arcane Enchanted, etc. The following is a very quick summary. Hover over the links for the stats of the latest live versions. Once the player activates the skill, the Barbarian will leap from his current location, to the location of the mouse cursor, damaging and knocking enemies back upon landing. This skill is best used to reach ranged monsters, who are behind enemy lines and to escape tight situations, if such occur. Leap has not changed much from D2, and has been demonstrated repeatedly in the gameplay movies. The main difference with the D3 version of this skill is that minor damage is dealt to everything nearby when the Barbarian lands, rather than major damage to one particular monster. A video of Leap in use can be seen below, courtesy of the DiabloInc You Tube channel. Bloodthirst - The Barbarian gains life based on the amount of damage he deals always. Weapons Master - Provides a damage bonus when the Barbarian is wielding a sword or dagger. Berserker Rage - Inflicts additional damage while the Barbarian is at maximum Fury. Brawler - Increases the Barbarian's damage when he is swarmed. Leaping at a few Fallen in the Borderlands. 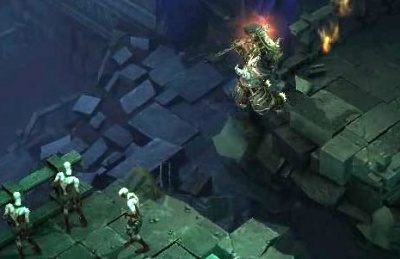 Leap (as Leap Attack) was revealed at WWI 2008 when Diablo III debuted. Originally, it was a Tier III skill in the Berserker Skill Tree. By BlizzCon 2009, Leap Attack was at Tier IV but was otherwise unchanged. Skill tiers were removed for the July 2011 Press Event, allowing skills to unlock steadily from levels 1 to 30. Consequently, all skill levels were adjusted and Leap Attack became a level 6 skill. Leap Attack remained at level 6 when the beta started. With the Patch 13 changes, it was classified as a Tactics skill and moved to level 9. For the Beta Patch 14, Leap Attack was renamed Leap, re-classified as a Defensive skill, and moved to level 8. See the Barbarian skill archive for more details on previous versions of Leap (or Leap Attack) and other Barbarian skills. 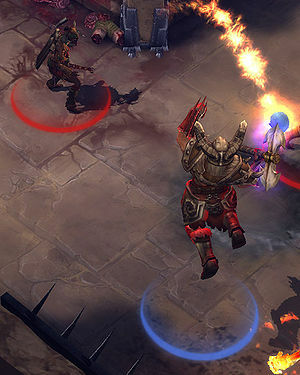 Leap seems to combine Leap and Leap Attack from Diablo II, whilst requiring Fury to use. The main difference with the D3 version of this skill is that minor damage is dealt to everything nearby when the Barbarian lands, rather than major damage to one particular monster. Leaping a chasm in the dungeons below Tristram. This page was last edited on 3 November 2017, at 03:36.